Seeing as we all live busy lives, our Microwave is probably at the centre of many of our kitchens, whether it be for a quick fix meal in a hurry or to re-heat that hour old cup of coffee you didn’t have time to drink we all use this microwaving machines to keep our days ticking over. However, when is the last time you A) took a good look inside your microwave and following that B) Gave the Microwave a good clean out. 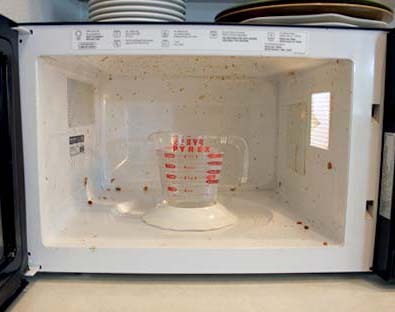 We would guess its been a while, but fear not we have a super easy and super quick way to clean your Microwave. You won’t need to scrub, you won’t need to buy any expensive cleaning products and you won’t need to leave your microwave stewing overnight in a smelly liquid. Ok, so now you have your tools, let’s get our clean on. Mix equal parts Vinegar with Water, into the Microwavable bowl. This doesn’t need to be measured, just add one cup full of Vinegar to one cup of water. Place the bowl inside of the Microwave and Put on high and heat the bowl for 7-10 minutes. The liquid will steam inside of the Microwave and will get into all that built up dirt. Once the Microwave has finished, leave for a further 2 minutes before removing the bowl (using Oven mitts or gloves as the bowl will be hot). Now take your sponge, lightly dip it into the Vinegar/water mix and wipe the inside of the Microwave. The dirt inside should wipe away easily and the Microwave will be cleaner than it’s been since it was new! All that Built up grease and burnt on food will simply wipe away with virtually no effort. You will have a temporary smell of vinegar, which dissipates quickly, but most importantly you will have a sparkling clean, chemical free microwave ready for your next meal. All done in 15 minutes!